Both the whole child approach and the Common Core State Standards "compel school instructional staff to develop and deliver effective, engaging instruction reflective of individual student needs and strengths." That's what we all want for our students, and we should expect nothing less. But the standards are undergirded by an "ethical core," and all educators should keep in mind that our ultimate purpose in teaching—indeed in creating schools in the first place—remains preparing the next generation to contribute to and improve our society. The Common Core State Standards are one dimension of reaching the goal of healthy students ready to be competent, thoughtful, and informed citizens. Do We Need to Burn Our Violins and Close Our Swimming Pools? "To compete with China in education we will need to burn our violins and close our swimming pools." Author Yong Zhao said this last week in Melbourne, Australia, at the 2012 Joint Australian Primary Principals Association and New Zealand Federation of Principals Trans-Tasman Conference. Zhao presented a keynote at the conference, as did ASCD Board of Directors member Pasi Sahlberg and author Andy Hargreaves. Interestingly, the themes each speaker touched on have relevance to not only Australian audiences, but also those around the world who are going through similar discussions. Call them the Global Education Reform Movement (GERM) discussions. Post written by Douglas B. Reeves, founder of the Leadership and Learning Center in Salem, Mass., and author of ASCD books on educational leadership. Connect with Reeves by e-mail at DReeves@LeadAndLearn.com. This post was originally featured in ASCD Express. What does "college and career readiness" mean? The Common Core State Standards suggest some clear and reasonable criteria. Consider the example of critical thinking. The Common Core documents suggest that students must be able to examine claims, arguments, and evidence and determine whether or not the evidence supports the claim. In addition, students should be able to advance arguments and support their ideas with evidence. The Common Core also places a heavy emphasis on informational writing, a need highlighted by college professors frustrated by the poor writing skills of even high-achieving high school students. My name is Sandi Lauzon and I am the vice principal at Byrne Creek Secondary School responsible for technology. I try to attend the Computer Using Educators of British Columbia (CUEBC) conference every year, as it is without a doubt the best way to connect with like-minded educators who ultimately leave you inspired by the techno-risks they have taken in their classrooms. Their stories of innovative practices always start with a passion to shift learning and teaching in a new direction, but more often than not they include bureaucratic hiccups; creative work-arounds; young heroic teachers willing to take risks; and students who adapt, engage, learn, and, ultimately, teach us all. At the end of the conference, I like to mill about and catch up with colleagues from other districts. With my iPad in hand, I asked one of the board members how the iPad Inquiry project was going. CUEBC lends out 11 iPads to teachers to use in their classrooms for a month at a time, and I had been following the project online. As it turned out, the iPads did not have a home for the following six weeks and I left the conference with them and a lot to think about before Monday morning. In my role at Byrne Creek, I had already been looking at how the iPad could be used with our English language learners, and now we had the opportunity to justify a purchase of 20 iPads if this pilot project was successful. All we needed was a passionate teacher with the skills to move beyond the apps, who could embrace the iPad as a powerful tool for student learning and was not afraid to jump in and explore the potential of the iPad as means of engaging, creating, and communicating. Helen Erickson, without dipping her toe in to test the water, accepted the challenge and jumped right in. Here is her story. Post submitted by Tim Magner, executive director of the Partnership for 21st Century Skills (P21), the leading national organization that advocates for 21st century readiness for every student. Magner has had an extensive career in education, serving most recently as the vice president of Keystone for KC Distance Learning as well as the director of the Office of Educational Technology for the U.S. Department of Education. Follow P21 on Twitter @P21CentSkills. The Partnership for 21st Century Skills (P21) has spent nearly 10 years bringing together leading education, business, and nonprofit organizations to provide a unified framework defining what students need to know and be able to do, not just to succeed but to lead in the 21st century. By defining success holistically as the fusion of both knowledge and skills, P21's Framework for 21st Century Learning is focused on preparing students for college, career, and citizenship. The Framework includes the 4Cs of creativity and innovation, communication, collaboration, and critical thinking and problem solving, together with life and career skills and a mastery of technology, media, and information. To many students, school is just a place they go. How do we create engaging learning experiences that make school more personal for them? Students need to be motivated in their learning before they can apply higher-order, creative-thinking skills and, ultimately, be prepared for their future college, career, and citizenship success. Post submitted by Teri Dary, cochair of whole child partner the National Coalition for Academic Service-Learning (NCASL) and service-learning consultant at the Wisconsin Department of Public Instruction. At NCASL, she leads collaborative efforts to advance academic service-learning in the school setting among state-level service-learning experts. Connect with Dary through the NCASL website and follow her on Twitter @NCASL_TeriDary. Service-learning engages students in powerful ways, helping them to increase their academic engagement and performance, civic engagement, and social-emotional learning. Students connect to the community and their classmates in ways that are far more powerful than simple cooperative learning. And by applying their knowledge and skills to solve actual community problems, students experience the real-world value of what they are learning in school. Post submitted by Elizabeth Ross Hubbell, a principal consultant at McREL and coauthor of Classroom Instruction That Works: Research-Based Strategies for Increasing Student Achievement, 2nd edition. Hubbell conducts workshops and training for K–12 teachers on research-based instructional strategies and technology integration, writes curriculum models for online classes, conducts technology audits for districts, and trains school and district leaders in using Power Walkthrough software. 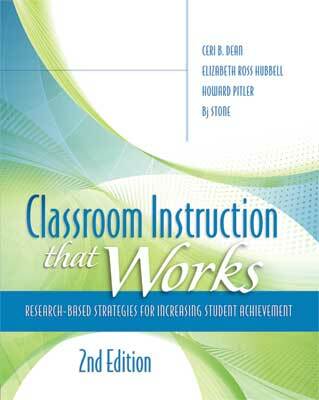 In the second edition of Classroom Instruction That Works (CITW), the authors addressed oft-answered questions of when to use the nine categories of research-based instructional strategies and whether the strategies are hierarchical. We included the CITW framework (below) in the new edition because it makes clear the purpose of the strategies. Instead of listing the strategies in order of effect size, as we did in the first edition in 2001, this framework helps educators see that the three categories that create the environment for learning are the highest priority. Those that help students develop understanding eventually lead learners to extending and applying what they have learned in real-world contexts. Now teachers have a context for using the strategies and can apply them purposefully as they assess, teach, and mentor their students.